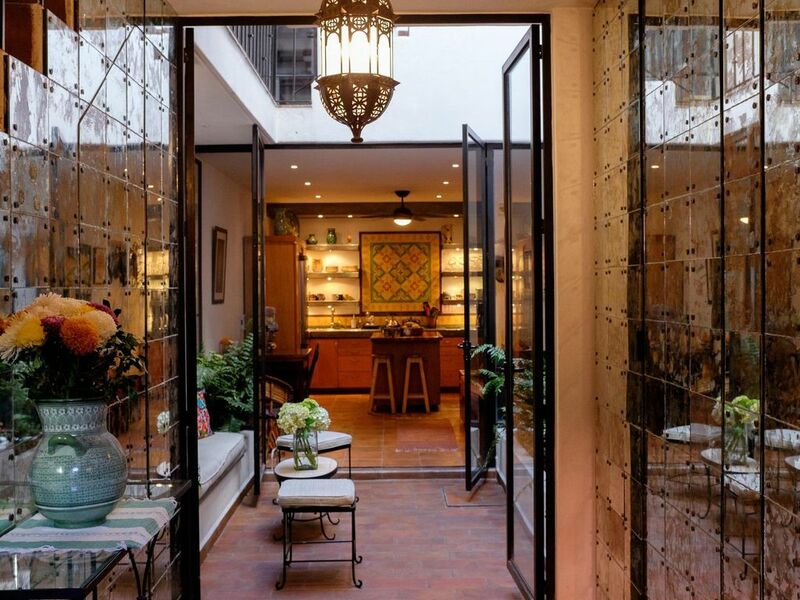 Casita Laurita is an architectural gem on one of San Miguel’s oldest and best loved streets, Calle Loreto. The three-story townhouse, designed by prominent Mexican/Norwegian architect Anja Fauske, has been called a 'jewelbox' by architects and designers who have stayed here. Open the modest door and be amazed at the cool, spacious, airy, sophisticated house. The name is 'Casita' but it is an entire house. Casita Laurita was featured in the Great Homes and Destinations column of the global New York Times on April 21, 2010. NOTE: This house is for a maximum of 4 people (two couples) and one child who could sleep on the day bed in the studio, but no more. Solo renta la casa por maximo 4 personas, o cinco con un hijo. Esta casa no es disponible para mas personas. Gracias! The 2-bedroom, 2.5-bath house is an easy and flat walk to the jardin, and steps away from the town’s famous artisan market. The house is Mexican modern style, built around a central courtyard, with clean design and exquisite details. The top terrace, with a roof for rain and sun, has comfy seating and a lovely view of San Miguel and its famous Parroquia church. A second patio is private and cozy, perfect for dreaming, surrounded with lavender, jasmine, and other scented potted plants. There is an outdoor seating area downstairs, too. A sunny studio with a 13-foot wooden desk makes Casita Laurita a wonderful retreat for a writer. The gourmet kitchen is a splendid spot for a cook who wants to explore Mexico’s cuisine. The house is modern but respecting historic style and materials. The entryway shimmers with patinaed glass and Moroccan-style lamps. The kitchen was designed by an award-winning food writer, with an island, toaster oven, French press and drip coffeemakers, good knives and cutting boards, and artisan plates. The kitchen table pulls out to accommodate eight; the island has stools for people who like to watch the cook. There's also a wine cabinet and lots of storage. Screens throughout the house keep out flies and mosquitoes. The stairs lead up to an airy office with a huge desk and napping couch, along with ergonomic keyboard and 2 comfortable and adjustable task chairs. (The napping couch has linens and is big enough for a child or an overnight guest, who can use the powder room downstairs without disturbing the other bedrooms). Wireless Internet and local phone service. Free US calls with Vonage phone. The study is also where you can find a great book to read on the terrace. A passage over the courtyard (open to the sky) leads to the master bedroom, with its full bath, Queen bed, and two reading lights. Plenty of closet space. Artisan-made bed and furnishings. High thread-count sheets, sophisticated palette, spare design. Modern bath has shower and artisan tiles with concrete shelves, modern fixtures, and baskets for personal items. Organic soap. The second bedroom on the top floor doubles as a media center, with a cozy Moroccan pillowed nook for viewing films on the flat-screen TV. There is an extensive DVD library of films. The second bedroom has a double bed, also with good linens and a comfy, firm mattress. Across from the second bedroom is a laundry area as well as a private terrace with scented potted plants. The top terrace has a teak sitting area with a sun umbrella and a wet bar. Although the house has many comfortable places to sit indoors and outdoors, there is no traditional living room with easy chairs and a large TV. This house is for a maximum of four adults and one child. Laura first came to San Miguel de Allende with her family when she was ten years old, to learn a little Spanish and a different culture (smart parents!). It was a wonderful childhood experience that made her forever interested in languages and travel. When she returned to SMA in 2007, she fell back in love with the magical town and bought a run-down lot in the Centro on an impulse. Everyone thought she was crazy, until a year later, when they saw the amazing house she'd built with her architect and friend, Anja Fauske. Location, location, location. Casita Laurita is on one of San Miguel's best streets--Calle Loreto. It runs through the artisan market, is convenient to the design center, and three blocks to the jardin in the center of town. It's a great location, and yet retains an authentic feeling of Mexico. It's wonderful to be right near the market and to live on a small, curving street with little traffic. I built this house to my aesthetic and practical tastes, with a lot of light and indoor-outdoor living. The house is comfortable and relaxing, with three terraces, and the top has a protected, splendid view of all of San Miguel. The office is beautiful, and a wonderful place to work, with an extensive lending library. Flowering plants on all floors, everything simple and elegant, and the kitchen has all the tools (sharp knives! Le Creuset!) a cook could desire. The neighbors are friendly and there has not been a robbery on my street in 30 years. I always feel safe walking around by myself at night. Please note that this house is not for people who have mobility challenges, as there are a lot of stairs. This also isn't the house for you if you require a large livingroom with a giant TV. Traditional Mexican tiles, modern fixtures, quality towels, baskets for toiletries, organic soap. Local phone as well as free US calls with Vonage phone. Gas heaters in every room. Carbon monoxide detectors for safety. There are several convenient parking lots near the house. Bath towels and towels for hot springs. French press, electric drip, or manual drip; coffee grinder. Everything you need; hand-painted lead-free pottery and serving dishes. Gourmet kitchen with excellent cooking pots, utensils, knives; coffeemaker, toaster oven, microwave, conventional oven, blender, teapot, french press, etc. Le Creuset. Table opens leaves to accommodate 8. Flat screen TV with basic cable. Excellent library of novels and books about Mexico. Many stairs. Also not good for small children. Maid service 2x/week; more if requested (extra fee). Wonderful office with 13-ft desk, ergonomic keyboard drawer, task chair; you may just finish your novel. Courtyard, two terraces, architectural gem. Near great organic market. One of the best Streets in town - comfy house - great roof terrace! Had a wonderful month at Casa Laurita in San Miguel - the location is perfect, the house efficient and comfortable - the connected staff terrific and responsive. The outdoor space is delightful- and watching hot air balloons pass over in the early morning was a highlight! I love the town and the Garden Botanico and the markets and creativity of the Mexican artisans. So happy I rented this great spot for a month! Thanks, Holly, so happy you enjoyed the house! Guillermo told me you were a great guest. Hope you return! There were four of us who shared this beautiful and wonderful space, and it was absolutely perfect! Lots of space for all of us, plus room if you wanted some alone time. We were within walking distance to the Artisan Market, Downtown, well…everything. Laura was a wonderful Landlady, Guillermo was really quick to assist us with anything we needed, and Pauola who cleaned, was really friendly and thorough. We could not have asked for a better place to stay in San Miguel de Allende. We highly recommend this little Jewelbox, because inded, that's exactly how we feel about it, and we would definately stay here again. Thanks so much, Ron, and I will pass along your compliments to Guillermo and Paula. Hope to see you back again soon! This is a really great property with an excellent location to everything! The house is very comfortable - especially liked the study area and the rooftop patio area! It is very well appointed and Laura has done an amazing job with making it super comfy for all with the tasteful decor that represents SMA! We appreciated all the great info you provided for restaurants, things to do, emergency contacts etc etc!! Guillermo, the property owner was great to work with. Take advantage of him to arrange a taxi through Abel who can take you on wine tours or other places outside of town. (wish we would have done that!). I would definitely stay here again and recommend this property to all. Thanks for a great place to stay! We loved San Miguel Allende. Dayna and Raul, thanks so much for staying at Casita Laurita, and I'm so glad you enjoyed it. Guillermo, my property manager, told me how much he enjoyed having you there. I hope you will return! Good location and beautiful home. Casita Laurita’s location was ideal and near the main attractions,. At first I wasn’t sure I had chosen correctly since the front of the house looks small but as soon as we stepped in I was pleasantly surprised and liked the layout of the house. Mr. Guillermo was very responsive and profesional in all of our needs and requests, I highly recommend Casita Laurita whenever in San Miguel de Allende. Thank you so much, Alicia, I hope you will return! We recently stayed at Laura's for a week. The property is a few minutes from the central square and quite safe. Great access to galleries, churches, and restaurants. We walked everywhere. We loved it overall. The property is well cared for and met most of our expectations. The pros: Large space that can easily accommodate a family or 2 couples. Multiple floors with various nooks and crannies. Great kitchen with all necessary accessories. Wonderful deck spaces, the top deck is really a great place to hang out, excellent views of the mountains. Nice plantings and other pleasant touches to make you feel at home. Laura's library has great books and excellent guidebooks on SMA and the general area. Free Phone access to US and locally is really helpful if mobile phones not supporting Mexico. Laundry access in the unit a real plus. The cons: This is a very vertical and rather narrow property set over 4 floors, not good for certain people. Bedrooms and bathrooms are nice but not luxurious. There are noise issues here at times especially dogs barking and a neighboring parrot so be prepared (this is part of the experience, not specific to this property). We used a fan to keep noise at a minimum. Heat can be an issue in the summer (in the 80's most days). We found that there was not great air circulation in the bedrooms. The fan is very helpful but it is loud. However, the pros certainly outweighed the cons for us. But, travelers should understand the issues. We loved it. Thanks for your detailed review, and I'm so glad you loved the house! A couple of points. San Miguel de Allende in the Centro is apt to be noisy occasionally, and my home is certainly not unique in being able to sometimes hear church bells, motorcycles, dogs, music, and human beings going about their business in the neighborhood. That said, in addition to the fan you mentioned, there is also a white noise machine in the bedroom, and a jar of fresh earplugs in the drawer in the nightstand. The fact that the house is a vertical townhouse is correct, and accurately described in my description and in the photos. This is NOT a house for people with mobility issues. The house was perfectly situated within a 10 min walk to the main 'Jardin'. When not exploring the charming city of SMA, there was no better escape than this house to call home. No detail is left out in this house! Relaxing on the main patio, reading in the library or taking naps on the top balcony/deck to the sounds of parrots & other birds was quite lovely. The open concept floor plan with wrap around catwalks and stairs gives a great view to each room and center patio. I hope to come back to SMA one day and stay here again! Thanks, Phillip, for your kind words. I'm happy you enjoyed the reading/relaxing/ napping vibe of the house and had a lovely stay in SMA! Come again! Artisan market, cafes, restaurants, arboretum, nearby Spanish schools and art schools, dance classes, cooking classes, galleries, design center, near jardin. Great organic shopping right nearby.